Smart Defrag 3 is a FREE, light, and stable disk defragment tool designed for maximum hard drive performance. 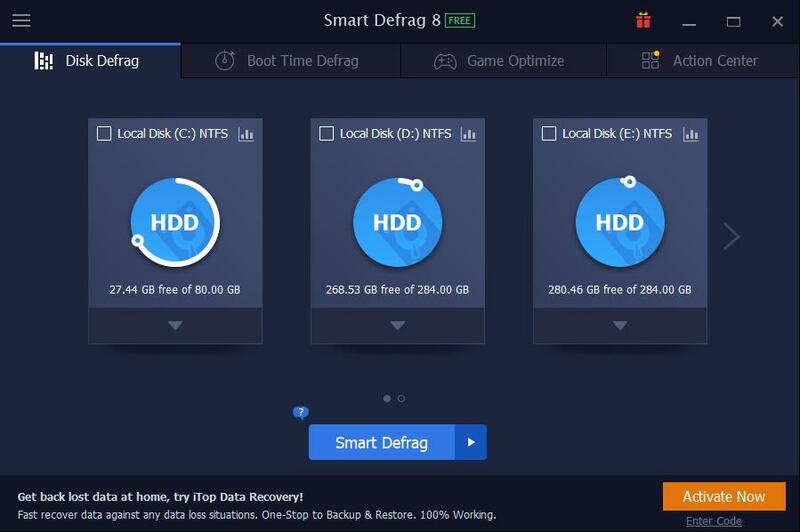 Based on IObit latest disk defrag engine and "Boot Time Disk Defrag" technology, Smart Defrag 3 not only provides defragmentation, like any typical disk defragmenter can do, but also intelligently streamlines your files based on using frequency, thus accelerating disk speed for faster data access! With the unique Deep Analyze technology, it smartly clean junk files before defragmentation to save more disk space for you. Being the first Disk Defragmenter that fully supports Windows 8/8.1 Metro Apps, Smart Defrag 3 works fast, automatically and quietly in the background and is a disk defragmenter suitable for large hard drives. Key features: + Added Volume Shadow Service (VSS) compatible mode - When defrag volume, we use advanced algorithms to close VSS intelligently, thus to release the volume space. It can improve defragmentation while still ensure the security of VSS. + Optimized defrag engine and enhanced its stability. + Improved defrag engine to support Windows XP permanently. + Improved GUI + Added and improved multi-language pack + Fixed bugs.